An Iranian ship believed to be masked as a cargo vessel has been identified as the "mother ship" stationed in the Red Sea providing targeting information for Houthi anti-ship attacks, which have increased in recent months, including a late July attack by Iranian-backed rebels on a Saudi oil tanker. Upcoming Trump administration action against the Saviz and other Iranian vessels is part of a broader package of sanctions expected to kick back in on Nov. 5, officials confirmed. Sanctions will target Iran's port operations, shipping and shipbuilding sectors, and other affiliates. U.S. officials familiar with the Saviz's actions in the Red Sea told the Free Beacon the Iranian vessel is barely attempting to obfuscate its military role in aiding Houthi rebels in Yemen. "The Iranians aren't even trying to disguise the military use of the ship," said one U.S. official familiar, who was not authorized to speak on record about the situation. "You don't need classified intelligence or satellite photos of the decks to know that merchant ships simply don't act this way." "If you're moving goods, you don't anchor in the same place for weeks at a time, let alone outside a war zone, let alone a war zone where militias are firing missiles at other ships," the source said. "The Obama administration enabled the Saviz to sail globally. President Trump will put a stop to that." 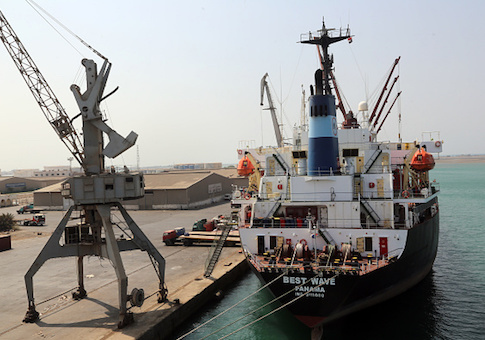 The Iranian ship's suspicious activities have been cited in recent months by U.S. military experts and foreign governments, including the Saudi government, which has been targeted by the Iranian-backed Houthi rebels. "A ship like Saviz could carry [Iranian military] Qods Force command and control elements and host berthing and logistics, while controlling the activities of smaller, lower-profile craft," according to J.E. Dyer, a retired Naval intelligence officier who recently published a lengthy analysis on the ship. "The maritime problem in a chokepoint is short-legged but very multifaceted. It's time to get the sanctions game face back on, and pay Saviz or her sister ships a visit with a U.S. cruiser or destroyer." U.S. defense experts with the Washington Institute for Near East Policy, or WINEP, also have cited the Saviz as providing potential support and logistics to Houthi rebels as they commit acts of terrorism in the region. WINEP's experts have advocated that the Trump administration "direct more intelligence gathering against the Iranian ‘mothership' Saviz, a cargo vessel moored off the Red Sea archipelago of Dahlak." "The Iranian military is likely using the Saviz to provide targeting data for Houthi anti-shipping attacks," according to WINEP. "Closer observation of the vessel and the threat of exposing its suspected intelligence role might be enough to make it leave the area. Alternatively, if authorities are able to prove its complicity in military activities, they may have a case for boarding and seizing it, which could yield further evidence that Iran is violating UN sanctions and supporting attacks on civilian vessels." U.S. military officials with Central Command, or Centcom, which controls American operations in the region, declined Free Beacon requests for information on the Saviz and its operations. "Saviz appears to have remained there for extended periods in the months since," Dyer noted in her analysis. "This is not the typical profile of a large, modern, ocean-going cargo ship, which would be expensively ill-employed lingering among islands in the southern Red Sea." U.S. officials and documentation confirm the Obama administration removed sanctions on the Saviz in January 2016, enabling its free travel across the region. Sanctions were lifted as part of U.S. commitments agreed upon under the nuclear deal, which President Donald Trump recently abandoned, paving the way for new economic sanctions on Tehran. The Saviz is just one of numerous Iran-related vessels that received a pass from U.S. sanctions in 2016. Sanctions on the Saviz and other Iranian vessels are set to be reimposed by Nov. 5, according to information published by the Treasury Department.